What inspired you to pursue the legal profession? As a Sikh, I attend the Gurdwara, the Sikh temple, regularly and read from the Guru Granth Sahib, which teaches the concepts of Simran and Seva — to meditate and to assist the community. My faith helped me develop a passion for helping others. Sikhism continues to influence my practice up to this day. Parmar Law’s logo is a lion and a khanda. I chose the lion as it symbolizes courage. A khanda, in Sikhism, symbolizes truthfulness. Taken together, my logo means the courage to speak the truth, which continues to inspire me in my day-to-day practice. The logo is also in the shape of a P and an L for Parmar Law. My family taught me from a young age that education and hard work is very important. I took a legal studies class in high school and it opened my eyes to a lawyer’s ability to affect the lives of others and advocate for the less fortunate. Lawyers can make the world a better place by working hard to advocate for people being taken advantage of and righting various injustices in the community. I feel blessed to be practicing law and pleased to be a mentor to an increasing number of lawyers in Calgary. I hope to see lawyers of various backgrounds take on more senior positions in the future. What was the most challenging thing to date that you faced as a lawyer in Calgary? For me, it was when I decided to start my own firm. Putting up your own shop is a daunting task as you are on your own – you have to navigate through things such as trust accounting, setting up systems and policies, developing precedents, looking for an office space, building your brand, and on top of it all, getting clients. My education helped me a lot in overcoming the challenges of starting my own firm. My Bachelor of Arts in Political Science (Minor in Management and Society), Bachelor of Commerce, and Juris Doctor – all from the University of Calgary gave me the foundation for understanding and maneuvering through the various challenges I faced. I was also fortunate to have had some amazing work opportunities. My seven years at TD Canada Trust, where I worked as acting manager on some occasions, taught me how to provide strong customer service experience. I also interned at the Canadian Embassy in Washington, D.C. after law school. There, I attended think tanks, focus groups, congressional hearings and conferences on behalf of the government. I noticed the need for more legal representation for both domestic and international concerns and gained the ability to market, build and foster relationships. I also articled at a small general practice and was also an associate at a medium sized firm in downtown Calgary, where I learned how to deal with clients and first learned of lawyers’ various day-to-day responsibilities and of the business of law. I followed that experience by working at Alberta Justice, where I learned how to carry myself as a professional and as a member of the bar. All these skills greatly help me as a sole practitioner. I had extensive experience in child welfare, family, criminal, immigration/refugee and employment/human rights law in private practise and then child welfare and family law with Alberta Justice; therefore, I decided to practise in these areas, along with child representation. These experiences helped me develop a niche within domestic violence and child welfare and also grow a practise in human rights and refugee work. As a sole practitioner, where do you turn to for support? I have had the privilege to work under and with some amazing lawyers. A highlight of my career was that very early on I had the fortune of working with the great Charlie Stewart Q.C. I was only able to work with Mr. Stewart for a few months prior to his passing. Despite the short amount of time, the lessons that I learned were invaluable. Mr. Stewart taught me various things such as how to analyze information, build cases, and how to examine evidence and run hearings. Mr. Stewart also trusted me with working on some very big cases early on in my career, which gave me more confidence. I was always in awe when I would attend court as Mr. Stewart’s agent, as he was very respected by his peers and judges alike. I was very inspired and looked up to him. Throughout my legal career, I have been honoured to work with lawyers of diverse backgrounds, including in terms of faith, race and gender, whom are some of the best lawyers in the city. The various lawyers that I have had the pleasure of working with are very approachable and are willing to communicate regarding any questions that I may have about the practice of law. The Canadian Bar Association is also an excellent source of support. The CBA frequently holds lunches where an expert lawyer or judge in a particular area of law is gracious enough to share their deeper insights. Not only have I learned a lot by going to these lunches, I am also able to connect with my colleagues and strengthen my professional network. I am also fortunate to reinforce and share my skills by speaking at these CBA meetings on various topics and on behalf of the Alberta Lawyers’ Assistance Society, in which I am a peer support volunteer. I highly recommend the CBA to any lawyer who needs support of any kind regarding the practice of law, and to get involved with executive positions, as I am with the Child Welfare section. How did your experience as a Crown counsel help your practice? My experience at the Crown’s office taught me a lot of things. Among other things, the Crown taught me how to conduct myself as an officer of the court, how to organize files, how to interact with clients and different professionals, and how to cordially work with opposing counsel. When you are working for the Crown, you are working for Alberta. You represent the government as a Crown Counsel, and the way you carry yourself is very important. On the other hand, when you are in private practise, you have different goals and it can be easy to forget your responsibilities as an officer of the court and become too emotionally invested in your files. My experience with the Crown helps me to remain calm, which ultimately helps me help my clients by allowing me to see the big picture and articulate better for them. Being able to calmly consider situations is very important as doing so enables you to see facts and legal issues that you may not see if you are very emotionally invested. Avoiding being too emotionally invested in files also helps lawyers from being burnt out, which is more common in the community than we would like. I’d like to think of it as like a doctor or physician. While a doctor may maintain empathy towards their patients, they are still emotionally uninvested. You do not go to a doctor to have them take your side emotionally. You go to the doctor for them to tell you how things are, for their unbiased diagnosis, and for their advice going forward. You rely on their expertise and knowledge. This is what lawyers should be – lawyers not being too emotionally invested in their files helps them become stronger lawyers. You were recognized as one of Calgary’s Best Mentors by the Sikh Youth of Calgary in 2017. Why do you choose to mentor? I was approached by the SYC’s mentorship committee to mentor a University student who was thinking of applying to law school. The experience was amazing. I was named as the Mentor of the Year. My mentee won the Mentee of the Year, a scholarship, and is now actively involved in the community. I have been mentoring more students ever since. These students have given me as much as I have given them. They reaffirmed my passion for what I do. Sometimes it is easy to get bogged down with work. It is nice to remember how privileged we are as lawyers. We sometimes forget that it can be difficult to get into university and do well in university; that it is also difficult to do well in the LSAT and get into law school; and even after doing all of that and doing well in law school, it is even more difficult to get articles. All of these things are privileges and we are fortunate to have succeeded so far that sometimes we forget all of the hardships that we have been through. They reaffirmed my excitement to be a lawyer and to be able to give back to the community and help them attain their dreams and aspirations as well. I am also now really good friends with my mentees and through this program I was able to be involved in other community initiatives. I advise my mentees and other lawyers that you need to be yourself. If you try to act outside of your personality, it usually does not work. Continue to educate yourself. Seek hands-on experience and volunteer. Be humble and professional, but don’t be afraid to speak the truth and don’t be afraid to fight for what you think is right. Don’t be afraid to show your passion. Be confident in your abilities. I think the key to this line of work is to find an area that you are passionate about, as when you enjoy and find purpose in your work, success shall surely follow. What are the things that make you feel the most sense of accomplishment as an advocate? My law firm’s tag line reads “Listen, Advise and Advocate.” I believe that these are the pillars to being a great lawyer. I feel accomplished every time I follow this mantra. I see to it that I follow this mantra for each of my clients. It helps me put my clients in a better position than what they were in before they came to see me. As their counsel, I ensure that I listen and pay attention to my clients’ specific concerns, which allows me to properly advise them and then advocate for their rights and position. I want to be able to take Parmar Law to greater heights. It has been going very well, and we are currently in a position where we could hire more individuals. 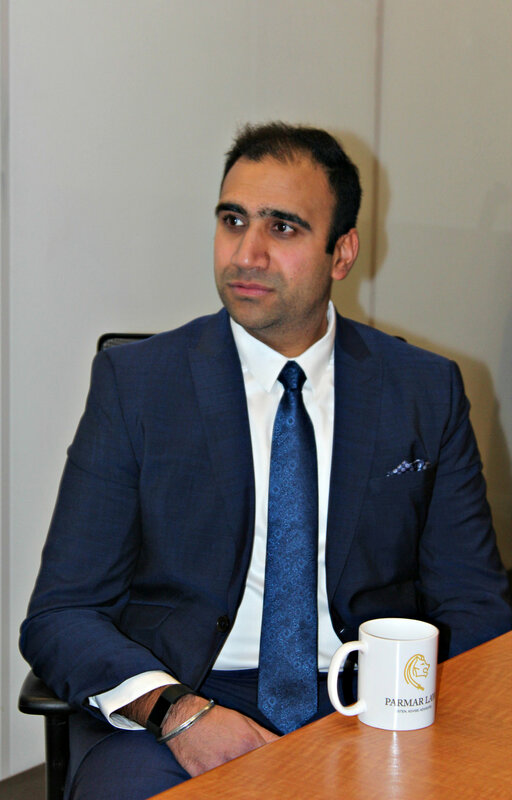 I want to be able to continue to help the people of Calgary by being the best lawyer that I can be, and for Parmar Law to be known as one of the best firms in the city. I would also like to start taking more work regarding international human rights initiatives. In the meantime, I would like to maintain going to the gym and spend more time with friends and family. I would also like to continue to travel the world. I recently learned how to play a Harmonium, which is a classical Indian instrument, during my trip to India. I plan on getting better at it.